Darwin Community Arts and its CemeNTworx Community Theatre are very excited to be hosting Forum Theatre Workshops facilitated by Omar Pumar Romay. 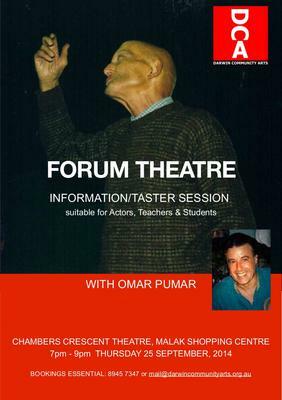 Omar has directed and facilitated over 100 community theatre and community cultural development projects and was the founder of Brisbane Multicultural Theatre. The free initial information/taster session is to be held on Thursday, 25 September, 2014 at 7pm in Chambers Crescent Theatre and will be followed by a series of specifically programmed workshops to develop acting skills. The workshops are suitable for individuals, community groups and professional artists, for making connections, to develop community spirit, and/or to give focus to specific current social issues. "Forum Theatre is a creative and entertaining way for individuals, students, workers and communities to liberate themselves. It is a first step towards dealing with difficult topics and a move towards open communication and community dialogue."